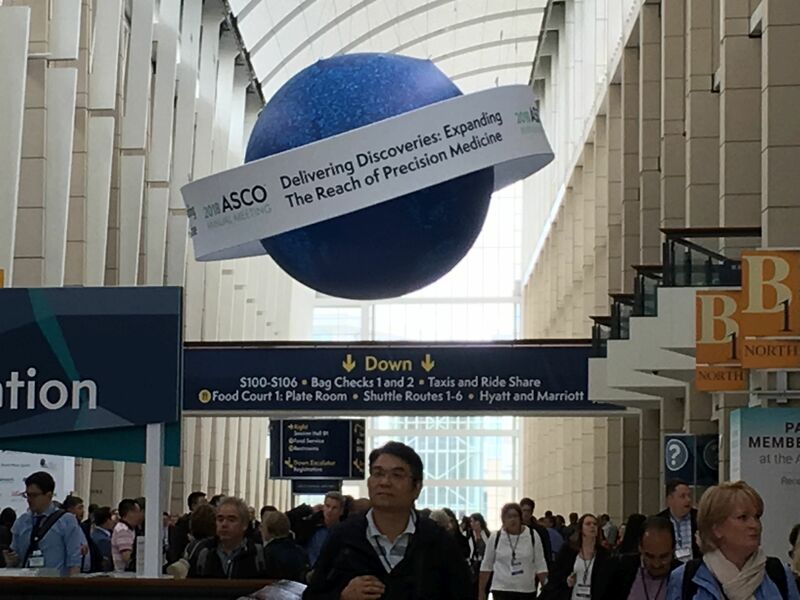 Chicago is once again the site of the annual American Society of Clinical Oncology Meeting (#ASCO18), where more than 30,000 scientists, advocates and representatives from the biopharmaceutical industry have gathered to share the their latest clinical findings and to learn from each other in education sessions, scientific presentations and opportunities for networking. The meeting began Friday and continues through Tuesday. The field of cancer science is moving so rapidly and it’s exciting to see the progress being made, particularly in areas of immunotherapy and precision medicine. Friday afternoon myeloma was in the spotlight, with a dozen scientific studies presented. Remarkable advances have been achieved over the past decade in treating this painful blood cancer that begins in the plasma cells in the bone marrow. While a cure has not yet been achieved, survival rates have been dramatically extended with the median five-year survival rate improved from 34.6 percent in 2000 to 52.4 percent in 2015, thanks to a multitude of new therapies over the past decade. With so many new agents to work with, the next phase for physicians who treat patients with multiple myeloma is to optimize dosing and combinations. Several studies presented “triplets” of therapy – regimens involving three therapies. MM standard of care is lenalidomide (Revlimid), a drug that stimulates the immune system, combined with dexamethasone, an anti-inflammatory steroid. But most myeloma patients eventually relapse from this combination or do not respond – meaning they are refractory. venetoclax, a therapy that blocks BCL-2, a protein that prevents cell death, a necessary process that rids the body of damaged cells, combined with carfilzomib and dexamethasone. Each of these combinations showed good efficacy and promise for extending life; the potential cost of combining multiple therapies is, of course, also a concern. A study was presented showing the effectiveness of changing the dosing regimen of carfilzomib from two times a week to once a week, increasing convenience without doing harm to outcomes for patients. 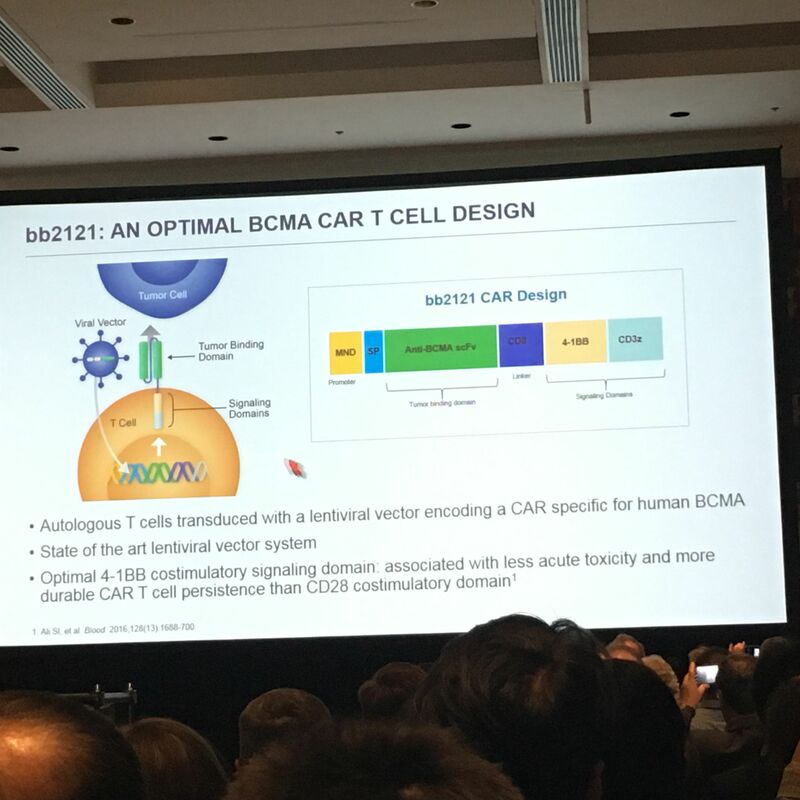 One of the highlights of this session was for chimeric antigen receptor (CAR) T-cell immunotherapy, which continues to garner significant attention. CAR T-cell immunotherapy engineers the patient’s own white bloodT cells, the soldiers of the immune system, to find and kill cancer cells. This CAR-T targets a protein on the surface of myeloma cells called BCMA. The data presented for bb2121, from Bluebird Bio, showed that the average median survival was extended for about a year with no significant safety risks. While it's still not clear if we've found a cure yet for myeloma, the results were truly encouraging. More than 95% of the 22 patients in the small early study responded; 50% had a complete response, meaning no cancer cells could be detected. The Leukemia & Lymphoma Society continues to support CAR-T for various blood cancers, including myeloma, with an eye toward making the treatment more effective and less toxic, available to more patients, and also understanding if there are biomarkers which can tell us who will respond and who won’t. The findings presented yesterday showed that the level of BCMA expressed on the tumors makes no significant difference in response. The study also raises the question of whether the therapy can be moved earlier in the diagnosis. The patients in the study shown yesterday had been heavily pretreated, some having received at least 7 or more prior treatments. Key takeaway: CAR-T continues to impress, and will add significant value to desperately ill patients. We still need more time to learn how durable these responses will be. Our Chief Scientific Officer Lee Greenberger, Ph.D., offers his insights for this therapy in this article by Matthew Herper at Forbes. Continue to check back to this blog for more updates from #ASCO18.